Cheap Custom Insulated Grocery Totes, Personalized in Bulk. Promotional, Best in America. Recyclable, Reusable. Black, White, Royal, Kelly, Forest, Natural or Red. Custom Insulated Grocery Totes, Personalized in Bulk. Cheap, Promotional. Recyclable and Reusable. Black, Royal, Forest Green, Natural, Red, etc. 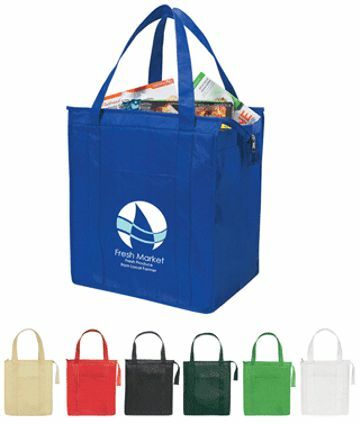 Bulk insulated grocery totes with large 9 in. gussets, zippered closure and front pocket, custom imprinted or blank (not imprinted). Our zippered grocery tote bags are made of 90 Gram, Non-Woven, Coated, Water Resistant Polypropylene, with the feel of cotton fabric. Budget Prices in the USA and Canada for wholesale insulated grocery tote bags. Free artwork design. We will send you a proof for your approval before production. American clients pay no taxes.